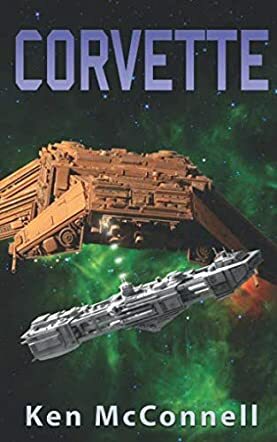 Corvette by Ken McConnell is a sci fi/fantasy novel that would appeal most to a mixed audience of adults and young adults who enjoy fast-paced science fiction that takes place in space. Lieutenant Armon Vance despairs that his career in the fleet is over when he finds himself assigned to an ancient ship at the edge of the known galaxy. Yet, little does he know that his career is not over but only beginning as he will face an important mission. His assistance will be relied upon to ensure the safe return of the ship and crew when they encounter a warship of the Votainion Armada. Will Lieutenant Armon Vance manage to keep the crew alive and get them back home safely or will he die trying? Corvette by Ken McConnell is a well-written novel that reminded me of a combination of the different Star Trek movies and the TV series. I enjoyed the combination of past and future that Ken McConnell seamlessly combined in this novel in that it had the feel of a naval battle with a futuristic setting. I found Lieutenant Armon Vance to easily be my favorite character because, even though he was only a Lieutenant, he did not let that stop him from showing himself to be a hero. The ways in which he aided his captain and his crew showed the strength of his character and his determination. Overall, I found myself impressed by both the book and the author as I was captivated by not just the plot, but also by the author’s unique writing style.